Build community and have fun! We’re bringing back the grade-level grants! 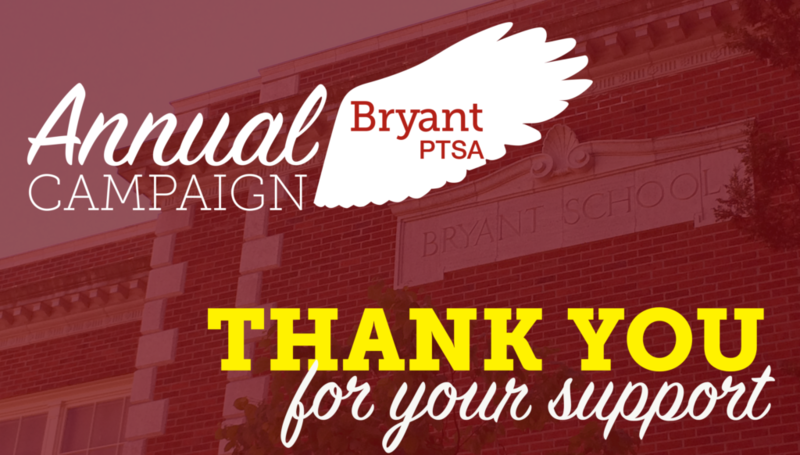 The Bryant PTSA is offering grants for you to hold an event for families in your grade level. Bryant PTSA will grant up to $500 to each grade level to build engagement among its families. The money is intended to help fund events for families to meet and form connections with each other, in the hopes that stronger social relationships will translate to a stronger school community for our children. Download the grade-level grant info sheet, or email ptsaexec@bryantschool.org for info today. Levy funding was at 4100 per student, but it is going down due to statewide cap, so that in 2019-20, we can collect 2500 per student ONLY. Statewide cap varies from district to district. SPS wants taxpayers to decide what local levies will be. Local levy is $2500, not state level levy. Some news reports state that SPS was dishonest in asking for more, but SPS has been straightforward about intentions. Most districts are at 1.50 per 1k. Our net tax bill for education is about half of what it is in Yakima. Net difference from before and after McCleary: Seattle had an 11% increases, Shoreline 24%, Bellevue 19%, etc. Is k-12 fully funded? NO. Supreme court has ruled that amount of funding is adequate; legislature is released from any other requirements/oversight for the year. Seattle needs 70 million to provide special ed. Only being provided 2 million for 2019. Gaps in funding with principal salaries, classified staff gap in funding. SPS hires more staff than state allocates, and pay more than state allocates. If we were to fully fund the Initiative 1531, (which has been delayed) we would get 780 more FTEs. Despite this, Seattle gets great results. Graduation gap closing, college readiness is increasing. QUESTIONS: SPS schools are funded based somewhat on poverty levels in the area.Does rate of Special Ed funding go up when population of Special ED kids goes up? In short, NO. Feds will not meet this demand, up to state to backfill. We have made great strides in identifying special needs but no great strides in funding. Prop 1 is 1% or less of SPS revenue. Levy in Feb is to continue functioning and will provide 15% of funding can’t really function or balance budget without it. Overall enrollment is down in SPS. Most likely due to housing costs rising. Current enrollment is 53k. Budgeting for a lower enrollment year for 2019-20. Levy in February- hopeful about outcome because Prop 1 passed by a big margin. October brought amazing Annual Campaign! 179k! Last year was 155k. Collected 133K in cash thus far, employer matching is 30k of total campaign. Otter pop party will happen as well for all school on the 15th. WA State PTSA calling upon DSHS to change definition of gender, call out to request volunteers to help make phone calls, telephone scripts have been written by Sam Fogg. Continuous school improvement plan (CSIP) is being worked on. Right now focus in on equity issues. Discussed Social Emotional surveys and whether or not Bryant will deploy a survey on our own besides the spring one that is required. Goal to get this survey out before Winter Break. Getting Brycentennial Celebration ready to go. School wide assembly at 1:15 on December 13th, and 5:30pm on the 13th for an Open House. Contacting local politicians as well as media. Honoring staff that have been here the longest as part of the anniversary date. Budget of $1500 requested- current ask from PTSA is 1k. (For Brycentennial). Motion passed for $1500. IDEA Project fund request- (Interactive Disability Education Awareness). One week of disability awareness. Fee $2k, ask for funding. Motion approved and seconded. PTSA approved $50 for assembly through email to invite Native American Speaker. Max Guerrer-Tomoda Counselor is asking for $500 for a library and $200 for sensory books, $700 total. Motion approved and seconded. Also conducting a Multicultural Event on January 31st, a night event. No Book Fair this December for various reasons. Proposal to have a Read-A-Thon instead. We need $20 per kid per year for library supplies, but right now funding is a lot through grants and afterschool programs. Books also need to be replaced as they wear out over time. Read-A-Thon- parents can sponsor their kids or just give a flat donation per kid, using Pledge Star. Read-A-Thon will happen over Winter Break. 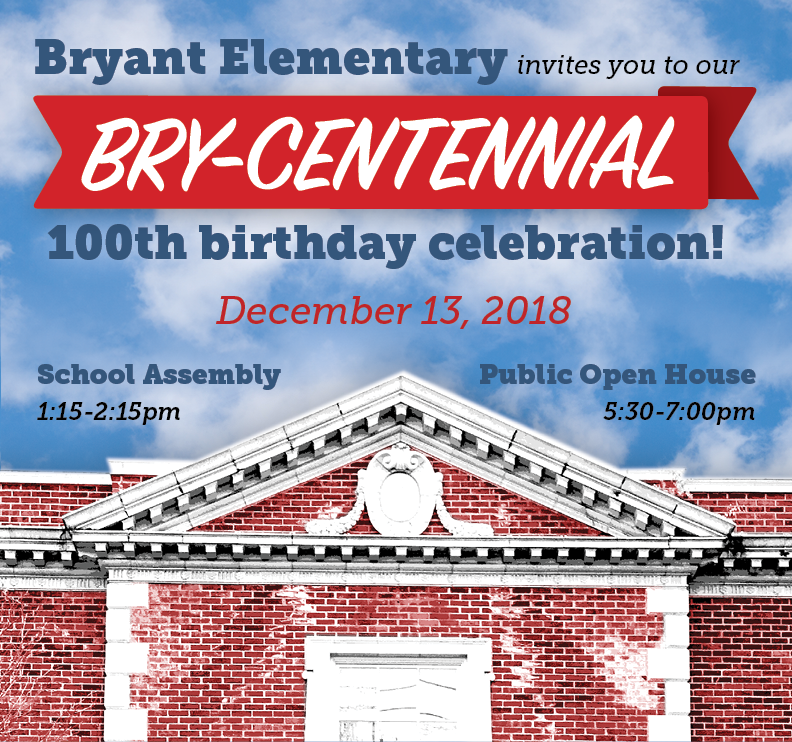 Join our Bry-Centennial birthday bash! On December 13 we’ll ring in our Bry-Centennial, starting with an all-school assembly for our students and families. Come hear stories from former students and teachers, learn more about our namesake, and take in presentations from our current students. Come back in the evening to celebrate with our extended community, including district and city officials, our neighbors, and long-time friends of Bryant. We’ll have light snacks and entertainment from Bryant years past. 2nd year/social and emotional support intertwined with curriculum. Question to consider: How do we meet needs of student with anxiety/self-esteem, etc., regardless of socioeconomic status? CCC designed to start out with early successes to establish baseline of success to increase learning. Starting to establish behavior expectations for playground/classroom/etc. Phase 1: Whole school expectations and the belief that when kids misbehave it is an opportunity to support them and create change. New section at bottom of treasurer report: net activity for self-supporting programs and restricted funds/everything else the same. Possible talk of moving Annual Campaign funds to other schools. Only in discussion at this point, no consensus. Possibility of Survey Monkey to find out what could be done with excess funds raised in future Annual Campaigns, will readdress after this year’s Annual Campaign. Website is up, you can participate or donate now. Frist communication Tuesday until 10/26. Participation rates can be checked daily. De-emphasize Halloween Celebration to support cultures that do not celebrate. Two Levies coming up and SPS needs to have these passed – critical for the budgets. Will provide community outreach to raise awareness about these levies. Tammy Shorr proposed a motion of $210 for volunteers that have not been WA residents for 3 years (Ann Sonnen seconded it)—Motion passed. Bry-Centennial Annual Campaign reaches 92% participation and we exceeded our goal of $150,000 in support of our kids!